Toni left this morning. Although it was short and I had to work a lot, her visit was quite wonderful! It all started at the airport. I stood for an hour waiting for her to come out of the gate, staring dutifully at the monitor in case she went out of the other gate. Then I feel a tap on my shoulder. Yep, she's standing right behind me. A whole hour watching for nothing! Apparently she came out the other gate and I missed her. I blame it on her hat. The whole time I was watching for blonde hair and she had to wear a hat covering it up! Oh well. Next time I'm going to tell her to come and find me. I'll be at the coffee shop reading. After our hour and a half bus ride, we made it home! It was only eleven thirty, so we went and got dumplings at the hole-in-the-wall across the street. 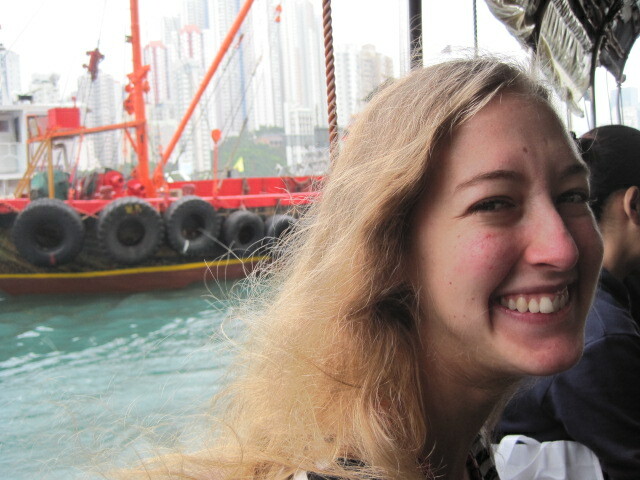 Then we walked around the praya (the park/walk by the harbor), talked, and then went to bed. Saturday, I had to work all day, unfortunately, but my parents took Toni around. We met up as soon as I got off work. My friends Josh and Lillian called, and they were in the neighborhood. 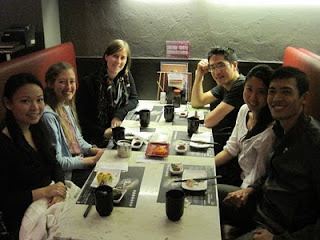 We met up with them and two of Josh's friends to go to a sushi shop. The next day was church, and we got there a bit late (we stayed up talking until three so we were just a little tired). 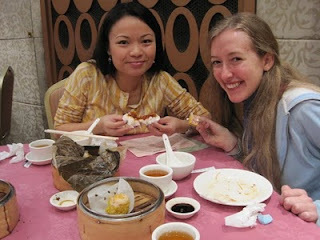 After church, we went out to get dim sum with Lillian. Dim sum is a bunch of little dishes which mostly come in round, wooden boxes. It's pretty darn delicious. Sunday night we finally made it to Ivan the Kozack's, a small Ukrainian/Russian restaurant. It's near the Escalators, the longest escalator system in the world. There's all sorts of restaurants and bars and clubs around the escalators. I had been to that place once before, but we had trouble finding it. We rode all the way to the top of the escalator system and then found it on the way back down. It turns out it's right at the beginning, down an alley. We split a chicken and mushroom blini and a strawberry and chocolate blini. The atmostphere was awesome. 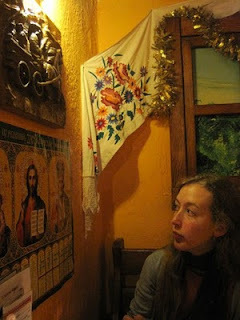 Toni, contemplating the icon calendar at Ivan's. After that we took the tram back to Wan Chai to go dancing. My swing dancing group meets every Wednesday, but occasionally it will meet on a Sunday or Saturday. We danced and talked for a couple hours and then headed home. Once again, we stayed up until threeish. I didn't have to work until one on Monday, so we decided to go to Stanley Market to do some Christmas shopping. We took a sampan over to Aberdeen and then a minibus from Aberdeen to Stanley. It was pretty fun, except I was almost late to work. Toni joined me during a free talk session and then read while I taught some more lessons. After I finished, we went to a Thai place to split some spring rolls and sticky rice with mangoes. Delicious stuff. We were trying to get to the light show, but didn't make it in time. 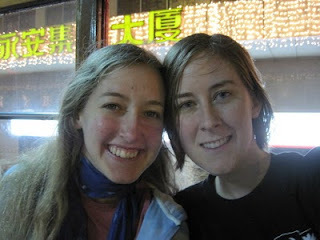 We decided to give up and go to St.'s Alp, a Taiwanese tea place, but that was also closed! After that, we went to a market for more Christmas shopping. Unfortunately, most of the stuff there was closed as well. Fortunately, one shop was open and we found some good stuff. After that, we headed home. We showed my parents our loot, talked awhile, then went out to get some dessert. There's a dessert shop down the street called "Kingdom Sweets" or something like that. We shared a huge plate of shaved, chocolate ice cream, which is always delicious. Finally, we walked on the praya and watched funny youtube videos before going to bed. This morning at six thirty, I walked Toni to the bus stop and sent her on her way. I'm so glad she could come visit! It was definitely fun times. it sounds like you two had an amazing time! i'm so glad she got to visit! This is awesome! Sounds like a good visiting adventure! ah, two faces i love. good times. You are an excellent blogger, Laura. So good to hear about your adventures with Toni!